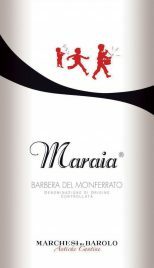 Terroir: The grapes used in producing Barbera del Monferrato come exclusively from best vineyards located in the community of Maranzana in Asti province. The vines are grown with Guyot (VSP trellised) system on hills with favorable inclines and terrains that are prevalently calcareous-clayey. Vinification: The grapes are hand-picked, destalked and softly pressed. Fermentation takes in tanks at controlled temperature of 82-86°F. After eight days of maceration, the wine is racked and aged for one year in traditional Slavonian oak barrels. The color is a lively and brilliant dark ruby-red. The perfume is fresh and intense with clean scents of wild berries, currants and sour black cherry. A light hint of vanilla and toasted oak. The flavor is warm and robust, full-bodied, pleasant and balanced. This Barbera’s sensory attributes make it an outstanding accompaniment for imposing first courses and main-course, meats boiled or roasted.